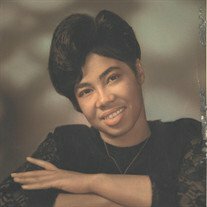 Obituary for Meredith Bryant | E.F. Boyd & Son, Inc.
Meredith Walker Bryant (Peachie) was born August 5, 1947 to the late Melvin and Johnnie Mae Walker in Meridian, MS. She was the youngest of 7 children. In 1952, the family moved to Cleveland, OH, where she attended Cleveland Public Schools. In 1966 Meredith was a proud graduate of East High School, where she received her high school diploma. After which she became employed as a seamstress at Joseph & Feiss and the Richmond Bros Company from 1966-1980. Meredith was a faithful member of Liberty Hill Baptist Church all the way up until her faith led her to care for her mother. Peachie was a great cook and she loved to bake. If you knew her you knew that every dish was made from scratch and with love. She was always the first to ask "have some dinner?". On October 29, 1980 a son, Kevin Bryant was born. Then on December 25, 1980, she married Herman Bryant and they were married 37 years. Meredith was a loving wife, mother, aunt, great aunt, great-great aunt and great-great-great aunt, the last of the first generation. She has gone home to join her sister - Ora Del Milles and five brothers, James Edwards, John Westley, Melvin, Jr., Nathaniel and Joe Carl Walker, preceded in death by her father, Melvin and mother Johnnie Mae Walker. She leaves to cherish her memory: one son, Kevin Bryant, husband, Herman Bryant and one sister-in-law, Vandean Walker and a host of aunts, uncles, nieces and nephews, cousins and friends.